AMRG - The American Model Railroad Group, Gosport. Welcome to the Gosport MRC web site! We are a friendly group of individuals who have an interest in railways, and mainly the North American prototype and model railroads, but any railway interests are welcome, British, European, or rest of the World! We meet once a month, and sometimes more frequently for practical "hands on" sessions, and hold a model railroad running meet and mini exhibition four times a year that is open to the public, usually February, May, September and November. You can always be assured of a warm welcome! We are also affiliated to the British Region of the National Model Railroad Association (NMRA) as some of our Group are also NMRA BR members. 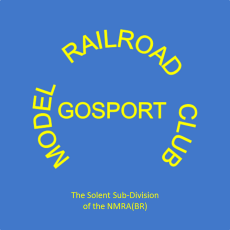 We are known as the "Solent Sub-Division" in the NMRA BR. However we remain an independently minded Group and our public meets are open to all visitors.